Harness Racing in the UK: 2016 Season: Week 24 - Standardbreds take on showing! 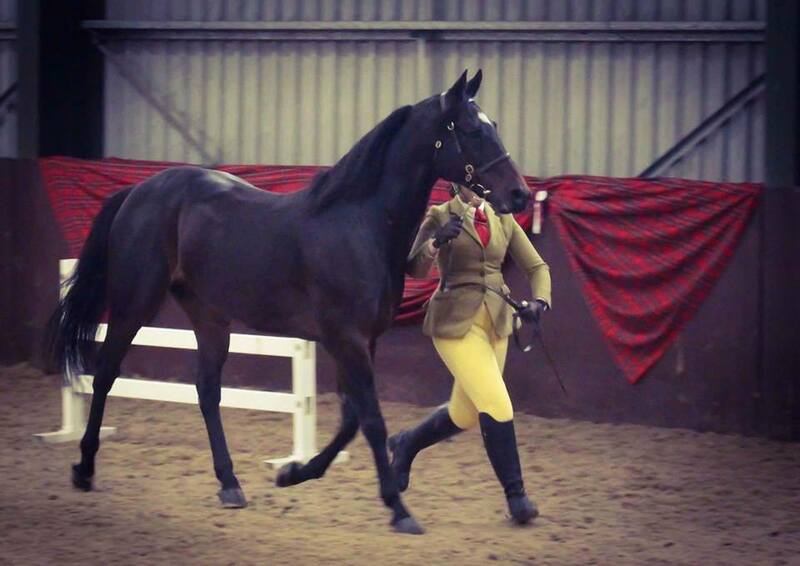 2016 Season: Week 24 - Standardbreds take on showing! The penultimate weekend of the 2016 racing season saw me skip Tir Prince in favour of another discipline, which is not often associated with Standardbreds but to which, with time and patience, they are able to excel at. Showing. Having bade farewell to Smarty on the Friday as he set off for Haydock Racecourse first, and then Tir Prince the following day, with his (un)trusty sidekick BMG, I set about preparing everything for the Anniversary Show at Howe, Fife, on Saturday. STAGBI had been contacted by one of the organisers to ask if we would sponsor the in hand and ridden classes, and then later the Championship. STAGBI provided the rosettes (made by Karen Kennedy of Corbiewood and Evenwood Ruthless fame) and then I personally sponsored the trophy on behalf of our very own Crosshill Stables. After all, who knows? Maybe one day a Crosshill horse may make it at the showing game. When I made reference to the classes on Facebook during the week leading up to the show, one individual took great umbrage with the idea that STAGBI was sponsoring showing classes. After all, Standardbreds are for racing. And the person felt that STAGBI should give more back in sponsorship for racing. Year on year the money that STAGBI has put back into racing has increased. In 2016, we introduced the Breeders Bonus Scheme, whereby the breeders of British-bred horses which won any of the pre-selected races would receive a monetary prize. This is in addition to the Breeders Premium, whereby the breeders of the three most successful horses in each country (by number of wins) receive a monetary prize (£600/£400/£200). A prize is also awarded to the breeder of the most successful horse sold through the Brightwells sale (one payment of £500+). Finally, in 2016 more Future Broodmares races were run than ever, with two in Wales (both at Amman Valley), one in England (York) and three in Scotland (all at Corbiewood). We continue to look at ways to promote racing, but it must be remembered that we are a breed society, not a racing organisation. If we give to one discipline, we must give to all in which Standardbreds compete. As racing is the primary purpose for which they are bred, racing is what receives the highest amount of sponsorship. Anyway, I digress a little. On Saturday I made the 1 hour 15 minute journey north to Howe. It was a wet and miserable morning and I was grateful that the show was being staged inside an enormous indoor arena, with a viewing area on the ground level. There was also a large holding area where the horses gathered before entering the ring, and a full size arena attached to the main area in which competitors could warm up. As a sponsor, I was invited to watch the day's showing from the upstairs viewing area, complete with its own bar, sofas, and a balcony which overlooked the main arena. My only complaint over the full course of the day was how cold it was inside the building, but that is partly my fault for not realising how long a day it would be and not wearing more layers (the transition period between summer and winter is always the same for me every year. I'm cold for a while until I establish how many layers are required to cope with the cold weather). When I arrived I bumped straight into the O'Neils (Kelly, Alice & Michael), who were prepping Ayr Escape for his first time in the show ring. You should remember Ayr Escape from some of my previous posts this season; back in June he won for the first time in 63 starts (five seasons) under the care of Michael O'Neil, who at the time was only 15. His father Hugh had explained to me that Escape was worth his weight in gold as he allowed Michael to learn the ropes when it came to training, and it paid off. Three weeks ago (nearly 4 now), Escape raced for the final time, after 108 lifetime starts. 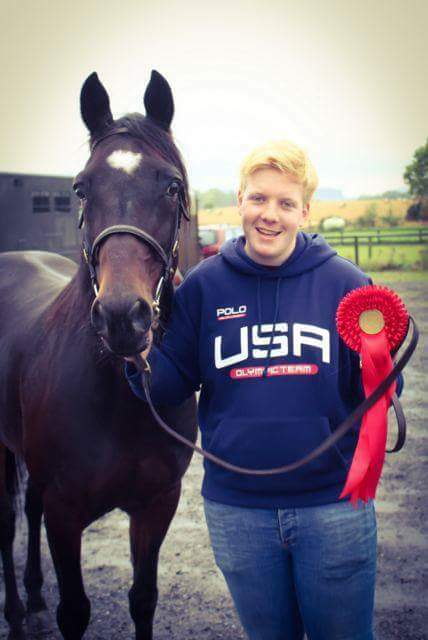 In the last three weeks, whilst Michael and his parents were enjoying the sales in Lexington and visiting New York, Michael's cousins Alice and Kelly have been prepping Escape for his new career in the show ring. They themselves are very experienced at showing, having done in hand and ridden showing for most of their lives. After handing in the rosettes and trophy to the main desk, I was shown to the sponsors area. There I met a couple who had travelled up from Shrewsbury on behalf of their organisation, '+15', which promotes disciplines which allow horses aged 15+ to compete. 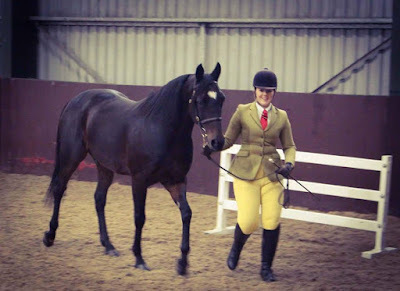 The show at Howe was the first Scottish qualifying event - the horse(s) that amassed the most points (dependent on where they placed in their classes) would qualify for a national event, all for horses aged 15 and over. We chatted for quite a while about harness racing, and how the maximum age is set at 14 years. The lady asked me several times if I couldn't petition the governing body to extend this to 15 so that they could work in conjunction with the sport. I'm not sure how I feel about this, and to save you all from going off on another tangent, I'll save that topic of discussion for another post. To give Escape a practice run (warm up) at the showing lark, he was entered into the Novice In Hand class, which was open to all breeds, but restricted to horses or handlers who had little or no previous showing experience. There were over 10 horses in the class, of all shapes, sizes and breeds. Escape showed himself off well, and Alice took the time to explain his breed to the judge during her individual section. He moved like a total pro, not fazed by the arena, the other horses or the supporters leaning over the side. When the judge pulled him into the final line up in third place we were all delighted. As the only Standardbred in the class, I thought this was an encouraging sign that he could place so well amongst so many other breeds and types. After what we all deemed to be a successful start to the day, Escape returned to the ring two classes later to compete in the Standardbred In Hand class. It was at this point that the judge completely fell in love with him. When I entered the ring to present the rosettes, she told me that Escape was "beautiful, but he knows it!". I was amazed that within less than half an hour of being in his company, she had managed to describe him perfectly. He literally turns his head when he hears a camera going off; on the track with my camera set to continuous, he lands on the perfect stride in every frame. Every time. He's a beautiful horse by anyone's standards, but he really does know it. The judge loved him so much that she awarded him first place, which we were all absolutely over the moon about. This also meant that he went forward to the Championship where he would compete against the winner and runner up from the Standardbred Ridden class later in the day. So it was now time for us to take a break and watch Alice and her Thoroughbred mare, Lottie, compete. 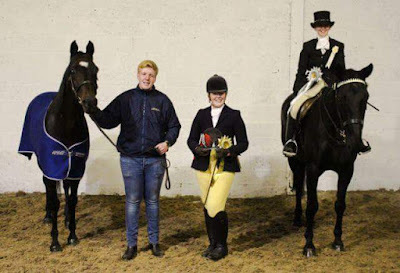 The ridden class in the afternoon was won by a beautiful part-Standardbred who is new to showing but already proving to be rather good at it, with the other qualifer for the Championship coming in the form of a 22-year-old Control Factor mare called Storm Control. Her owner told me she had competed at showjumping in her former years to a relatively high level, as well as dressage and now showing. She looked fantastic for her age. We had to wait rather a long time for the Championship in the evening, by which time we were all pretty much ready to go home. As the three horses entered the ring for the Championship, I thought perhaps the judge would award Champion and Ridden Champion to the two ridden horses as it was easier for them to 'show off' than it would be for Escape in hand. When it looked as though she had made her decision, I entered the ring with the rosettes and trophy. She told me that she was going to award the two places to the full breds, and the Championship had to go to Escape because she "love, love, LOVED him". It was all I could do not to turn to Michael and his family on the side of the arena and give them the thumbs up! When she called Alice and Escape forward as the Champion I must admit I did have a tear in my eye! And so did Alice. It was thoroughly deserved and so wonderful to see a horse who was racing less than a month ago being awarded the highest prize at a new discipline. The owner of Storm was also delighted to be named Reserve Champion, as she thought perhaps the two places would go to the two class winners. Happy faces all round! 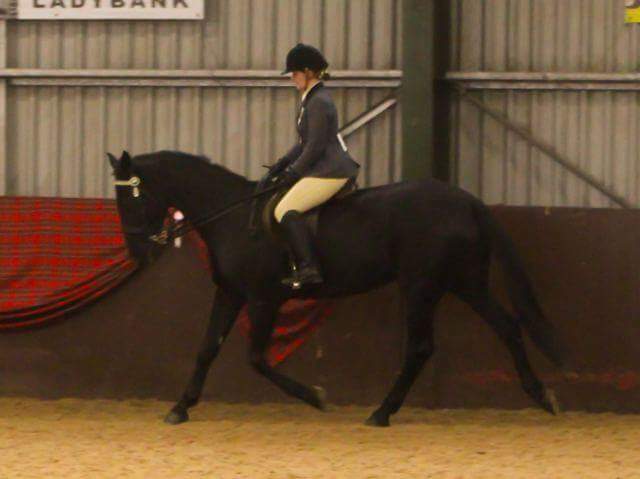 Although the classes weren't as well supported as I had hoped they would be, I am not deterred and I will be trying to get Standardbred classes added to a number of shows in Scotland in the coming months. After that, I may try to work with owners across Wales and England to see if this is something we can roll out across the UK. Standardbreds, like Thoroughbreds, need somewhere to go once they finish racing, or indeed if they weren't able to make the races in the first place. Some mares have the potential to go on to be broodmares and create the next generation of racehorses, but very few colts go on to be stallions and indeed, most are gelded. What happens to the geldings when they retire from racing at 6, 7, 8 etc.? Some can stand in fields growing old while their owners watch over them. But not everybody is able to keep older horses (I laughed to myself at the concept that a 7 year old horse could be classed as 'old'). These horses have as much as 20 years left of living to do. And I know from personal experience how great they are at other disciplines. So do a few other people, and slowly the opinion of the breed is changing. Events like the Standardbred classes at Howe allow the general public who have never met the breed before to learn about them. The judge was bowled over by their manners; before the Championship the organiser made a small presentation providing information about Standardbreds and harness racing. This is called free advertising, to all those people who moan the face off me saying things like this are a waste of time. People left the centre on Saturday knowing about Standardbreds (I talked to several strangers, as I do, and told them exactly why I was there) and witnessing how wonderful a breed they are in temperament and looks. The owner of Storm even told me that she would be very interested in looking for another Standardbred once she retires Storm, based purely on how great a mare she has been for her. I am on a personal mission to educate people about these horses and everything they are capable of (which is everything). Events like this give me a platform by which to show off Standardbreds, who really just show themselves off so well. I'm fortunate to know a large number of people who share this personal mission. We want to give all Standardbreds, not just those we own, a chance at going on to do something else when they finish racing. Events like this also show racing owners that their horses have options when they finish racing. On Sunday I returned to Corbiewood after two weeks away from the track. I don't really know what to say here. I am conscious that this blog is a platform from which I can take British harness racing to the wider world in all its glory and greatness. But I'm also not a liar. I am at least able to find the good amongst the bad, so on that subject it was fantastic to see Killarney Howard and driver Hugh O'Neil Jnr Jnr enjoying their third successive win in as many weeks at the track, all but guaranteeing them the coveted 'Horse of the Month' award at the forthcoming dinner dance in November. It was also wonderful to see old warhorse Ladyford Lad, aged 13, notching up another victory this season, this time with the contortionist blacksmith Jackie Campbell taking the reins. Sunnyside Clinton from my friend George Carson's stable also ran credibly to finish second in his race, showing improvement with each run. I'll not dwell long on the uglier side of the day's racing, but long enough that you are at least all aware of Corbiewood's shortcomings as a track sustained by the same pool of people on a weekly basis. Ever heard of the proverb, "Familiarity breeds contempt"? By definition, it means that extensive knowledge of or close association with someone or something leads to a loss of respect for them or it. Some of what I witnessed on the Sunday was due to a lack of respect for other drivers and for horses. Drivers cutting each other up and taking the legs off horses (resulting in horses falling and cutting themselves badly), drivers shouting abuse at each other, licence holders (owners, trainers and drivers) physically fighting one another off the track and spectators shouting such vulgar phrases during races as "F*CK HIM UP! ", which one can only deduce was a direction to a driver to pull in on top of another (bearing in mind this was after a horse had been brought down earlier on, and whose injuries I had witnessed first hand whilst it was being treated by the vet). After having missed the previous two meetings out of choice and not circumstance, I was watching the racing and the people with fresh eyes and I'll be brutally honest: I didn't like what I saw. A very hostile environment both on and off the track. People will do anything just to win £300. The above small section in a much larger post will attract plenty of negative criticism towards me both over the next few days, and potentially longer (some people will hold a grudge and challenge me the first time they see me in person, which could be some weeks from now). Regardless of the overall upbeat nature of the post, I have cast criticism out into the wider world and therefore I am now a terrible person. Go figure. What defines a horse's nationality?